The Yoga Sutras of Patanjali: Practice and Dispassion — The Contemplative Life. As we have seen, the goal of Yoga, according to Patanjali, is to still the changing states of mind. The question then becomes: How? "The states of mind are stilled by practice and dispassion." Much of the rest of the Sutras are elaborations on these two themes. "Practice is the effort to be fixed in concentrating the mind." All of Patanjali's practices are, it seems, forms of concentration meditation. The object being concentrated upon can change, but the method of concentrating the mind intently on that object remains the same. He first recommends repeating the mystical symbol om, which represents Isvara – the personal aspect of God (1.28-1.29). "Its (the mystical symbol om) repetition and the contemplation of its meaning should be performed. From this comes the realization of the inner consciousness and freedom from all disturbances (changing states of mind)." "Sutra 1.32 indicated that the obstacles to yoga can be overcome by fixing or concentrating the mind on an object, and the next few sutras outline various options and methods for accomplishing this. 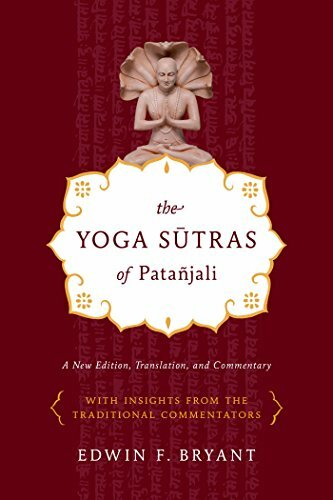 Patanjali has already presented Isvara as an object of concentration in the form of recitation of the sound om, and by placing Isvara first on the list of options and dedicating so many sutras to him, Patanjali has clearly prioritized an Isvara-centered form of meditation. The following sutras up to 1.39 all also contain the particle va, or. Thus they are all alternative and optional techniques for fixing the mind and, as with the Isvara verses, are to be read as referring back to 1.32, that practice on one object eliminates the distractions to yoga. One or more of them might be more suitable to a particular person, time, and places, says Sankara, hence the options." Dispassion, or its synonyms – renunciation, mortification, non-attachment – is part of the path of virtually all contemplative traditions. Not only must one meditate and be transformed through "practice," but one must also consciously give up attachments to the "things of the world" which bind the soul. It's not that the things are bad in themselves, it's that the soul becomes chained to them, it needs them. For a yogi to reach his final goal, all attachment needs to be broken completely. The way to break attachment to any object is to do without it. Not only does this include physical objects of pleasure, but even concepts about oneself. For instance, if one is attached to the idea of themselves as "attractive," they may have to renounce this by consciously ceasing to take actions to increase their appearance. In modern days, this may include not wearing makeup, not lifting weights, etc. The ideal for a yogi is a kind of "holy indifference." If pleasurable things come, so be it. If unpleasurable things come, so be it. Any sense gratification is only temporary, and indulgence in sensory gratification is a dangerous distraction for the yogi. For Patanjali, both practice and dispassion are essential to reach the yogic ideal.